When it comes to selling a sports card on eBay, Sports Buy or any other online selling or trading site, it's crucial to get a quality scan that properly showcases your card to potential buyers. Great sports card scanning can boost the sale price of your cards substantially. Arguably the worst scanning cards in industry belong to one of the hobby's most tradable and beloved brands, that being Topps' "chrome" formula. The slightest dash of dust always seems to show up on chrome cards, whether it be Bowman Chrome, Topps Chrome or any other Topps brands that use chrome stock such as Platinum, Bowman Sterling or Finest. I've found that the best way to get a high quality scan of chrome cards is through the assistance of a "Swiffer" duster. For those unfamiliar with "Swiffer", they are a company that makes interchangeable dusters. For around $5 at your local store, you can pick up a 5-pack box of Swiffer Duster refills. Seeing as how your using them for cards, you needn't buy the wand your supposed to slide the dusters onto. Although, the handle can come in handy if you don't trust your hands around cards. The "Swiffer" duster traps and locks dust, which makes them far better than dust spreaders like paper towels or dish rags. Not only does the "Swiffer" remove dust from your cards, it also removes dust from your scanner and the card cases. 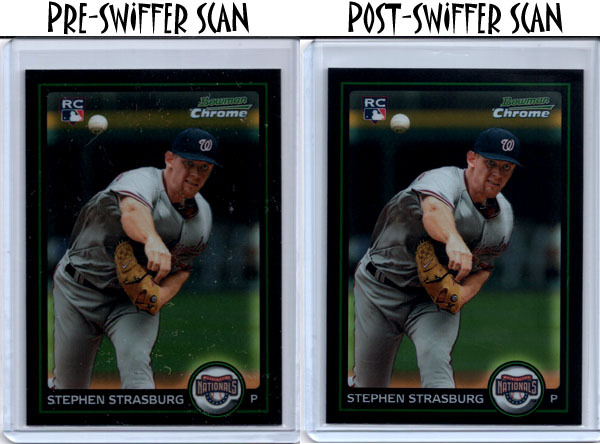 Below is a look at the drastic difference dusting can make on the scan of a card. Which card would you be more likely to buy? Be gentle when "swiffering" chromes, especially with autographs. Don't scrub, gently sweep the surface of the card instead. After a little practice, you will be scanning at a high quality level in not time! Actually tried this last weekend on a couple of scans. Surprisingly effective! Thanks for the great tip, Brett! hmm thats pretty cool, thanks for the info. Any suggestions on how to get good quality scans of Prizm cards?